The Texas Cichlid is a fresh water aquarium fish that is native to the United States. Scientifically, it is referred to as the Herichthys cyanoguttatus while it is also sometimes called the Rio Grande Perch. It is such a highly aggressive fish that should ideally be kept alone in the tank or other hard-line fish species of similar size but in a bigger tank. The tank should be at least 125 gallons or more because it is generally a large fish. This should not be your choice of aquatic freshwater fish if you are not keen on dealing with belligerent type of fish species. Basically, the best way to keep the fish species is to put a male and female in a tank of 125 gallons. Just be sure to be ready to separate the fish if you notice any sign of incompatibility between the pair though. Better still you can use a good material to divide the tank into two sections for the male and for the female. The overall appearance of the fish is generally bigger compared to other common species of fresh water aquarium fish. In terms of the color, well, the fish has got bright coloration something that makes it a favorite of some aquarists. It’s iridescent golden color featuring pearl highlights and white dots that adorn its body and fins makes it such a lovely fish to look at! There also several spots of black that can be seen just at the base of the caudal fin of the fish on the rear half of the fish’s body. The juveniles of the fish exhibit iridescent pearl-gray body and also white dots on the fins and parts of the body. The juvenile fish are not overly aggressive as the full grown adult fish. The males are brightly colored than the females and are also bigger in size compared to the females. Older males will develop a characteristic cranial bump that may come in handy for you to tell the time they have lived. As usual appearing smaller than the males and also a little dull colored compared to the males. The natural habitat of the Texas Cichlid is the Southern United States and North East Mexico. It is considered the only cichlid fish species to appear naturally in the US without having been introduced there by humans. It is a fresh water fish that will be found in fast flowing rivers and also in still waters such as ponds and lakes. Interestingly, it can easily dwell in neutral and slightly hard waters of pH between 7.5 and 9.0. The fish is also capable of adapting to big variations of temperatures thus making it easy to keep in a number of aquarium conditions. The fish will easily live in both warm and cold waters something that has enabled it to expand to regions which were not originally its habitat. The fish is even being considered to be an invasive species for the fact that there are certain areas it has driven out common fish species. Due to the high adaptability of the fish in diverse water conditions keeping it in the tank isn’t much of a deal even for a beginner. 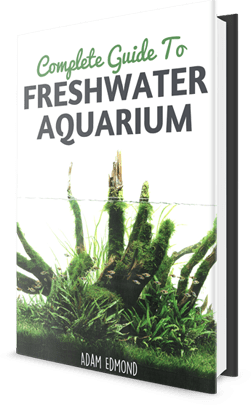 The major issue with the fish is its rather high aggressive nature meaning that if you wish to keep it in the same tank with different fish species you need to be careful. Due to the high aggressive nature of the fish, it has a tendency to turn any nice tank it is kept in to a complete mess! Because the fish grows big even under captive condition a tank that can be able to hold at least 44 gallons of water of more is advised. Remember 44 gallons of water is only ideal for a single fish so that if you are planning to keep more, you will need a bigger tank! Of course you can keep the fish in smaller tanks but they will not grow sizes they ought to. The tank temperature should be regulated within the ranges of 24-26°C. As for the pH of the water even though it has the capacity to adjust to hard water just ensure the pH is between 6.0-8.0. Also ensure that the filtration of the tank is well taken care of due to the messy nature of the fish. This will somehow help keep the water quality better. Always renew the tank water on a regular basis because the fish is the kind that will leave behind lots of organic waste after every meal. At the bottom of the tank put a substrate layer that is thick as this will help to withstand the digging activities of the fish. Better use gravel or sand at the bottom of the tank. It is not a good idea to place live plants in the tank because the fish may feed on them. It is an omnivorous fish and thus feeds on both plants and other small animals thus feeding it is not complicated. You can feed it pellet feeds that are of good quality. Better still you can feed the fish live food such as brine shrimp and well as frozen food. Just ensure that you remove any leftover live food particles from the tank to avoid the possibility of bacteria developing in the tank. 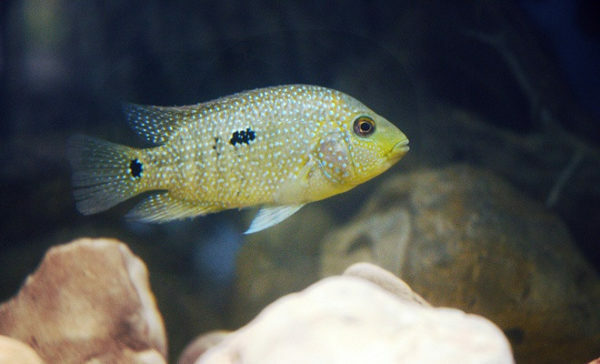 Texas cichlid is a kind of fish species that is not hard to breed and you can place a male and a female in the same tank. If everything goes fine, courtship will follow and the opposite sexes will flirt with each other. In an interesting occurrence you can easily see the male trying to flap the side part of the female body. Once the fish are ready for the spawning process, they will clean an area usually the bottom part of the tank where there is sand. He female will then lay her eggs in the ‘cleaned area’ and eventually the male will fertilize the eggs successfully ending the spawning session. The fertilized eggs will take up to 2 days for them to finally hatch into fry that you may then collect to a different tank. In about a week or so the juvenile fish will be ready to swim on their own and fend for themselves. This cichlid is nothing compared to the hybrid cichlid i m getting called the (RED PHOENIX KING CICHLID👑) the male grows up to a large 32 inches and is extremely extremely extremely extremely extremely aggressive/territorial/quarrelsome and predatory. he will thrash a Texas cichlid.😆😆😆😆😆😆😆HA HA HA HA HA HA HA HA HAAAA.